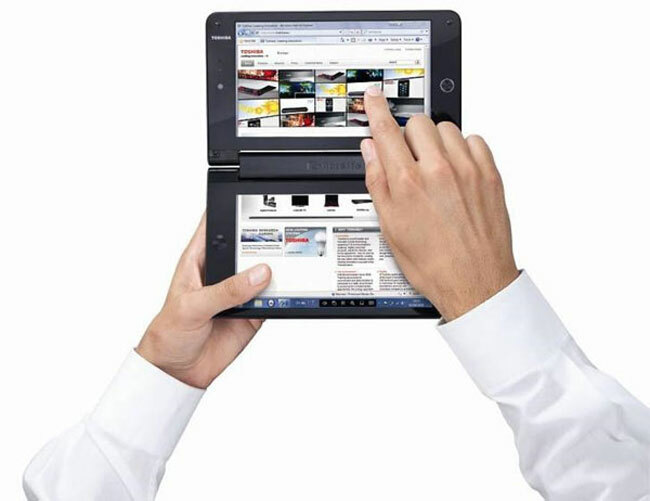 Earlier today we told you about the new dual screen notebook/netbook from Toshiba, the Toshiba Liberto W100, now there is a video of this new dual screen notebook in action. As you can see in the video below there are two 7 inch touch screens and a virtual keyboard, which means you can use it like a normal notebook with one screen as the display and one for the keyboard. The Toshiba Liberto W100 features an Intel U5400 processor, 2GB of RAM, a 62GB solid state drive (SSD) and one USB 2.0 port, there is also a 1 megapixel web camera, a microSD card reader and a battery that will give you up to five hours of usage. There are no details as yet on when the Toshiba Liberto will go on sale and how much it will cost.